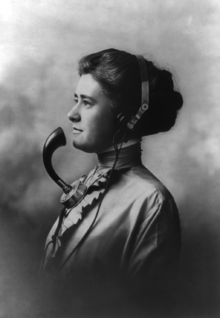 Female telephone operator, 1911. Photo copyrighted by the New England Telephone and Telegraph Company, which was founded by Alexander Graham Bell and his father. This company is later absorbed by American Bell and subsequently, American Telephone & Telegraph Company (AT&T). 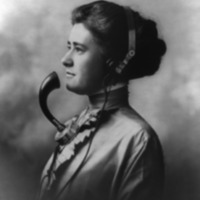 Photo copyrighted by the New England Telephone and Telegraph Co.
Photo copyrighted by the New England Telephone and Telegraph Co., “"A Telephone Operator",” Théâtrophonics, accessed April 19, 2019, http://theatrophonics.org/items/show/80.